A radiolarian fossil from chert. The more I learn about geology, the more often I find that present processes do not account for the sedimentary rocks laid down in the past. The concept that only processes observed today should be used to explain the history of the rocks is the geological doctrine of uniformitarianism. This is often summarised by the slogan: ‘The present is the key to the past’. It is upon this doctrine, rigidly held, that practically all geological data has been interpreted. As if by a single pen stroke, this doctrine eliminates from consideration the very possibility of the global Flood recorded in the Bible. It is true that in recent years the doctrine has been modified to allow an occasional catastrophe, such as the Lake Missoula flood1 and an asteroid impact that supposedly wiped out the dinosaurs.2 But basically the doctrine continues to undergird mainstream geological thought. At the same time, research on the rocks reveals that uniformitarianism is a poor organising principle and often invalid. For instance, sandstones, which make up approximately 20% of the sedimentary rocks on the Earth, are consistently different from modern sand deposits.3 As an example, ‘Pure quartzites (orthoquartzites) are common in the older record but none seem to be forming today’.4 Quartzite is metamorphosed sandstone. The evidence is consistent with the global Flood, which would be expected to deposit sand in sheets. … uniformitarian geologists are left only with speculations about the past for the origin of chert and radiolarian chert. But chert in sedimentary rocks can be thick and aerially extensive. In Borneo, for example, a 100-m thick deposit of chert covers some 40,000 km2. Moreover, chert is commonly found in limestone as nodules and irregular lenses. Also, such chert nodules and lenses are not known to be forming anywhere today. Thus, the present is not the key to the past, but supposedly the past is the key to the past.7 In other words, uniformitarian geologists are left only with speculations about the past for the origin of chert and radiolarian chert. These problems with the origin of chert challenge the validity of the uniformitarian principle. Racki and Cordey7 review the competing hypotheses for radiolarian chert and conclude that all have flaws. Apparently, the hypothesis that radiolarian cherts are formed by consolidation of siliceous oozes is not popular. Siliceous ooze forms today on the sea floor in areas where the remains of radiolarians and diatoms (microscopic marine algae) sink. As creationists, we must always be aware that uniformitarianism is just a philosophical hypothesis,12 and that the rocks are not easily explained by it. A few comments made by Racki and Cordey7 and Pettijohn3 on the origin of bedded chert and radiolarian chert offer a basis for an alternative hypothesis of catastrophic formation during the Genesis Flood. Pettijohn13 remarked that many scientists believe bedded chert was directly precipitated from silica-supersaturated water and that the radiolarians in the chert are incidental. Moreover, Racki and Cordey14 suggest that volcanic and hydrothermal processes may have quickly increased the silica content of the water. The silica concentration of hydrothermal water can be over a thousand times that of ambient seawater. So a Flood scenario can be envisioned in which volcanic/hydrothermal processes added great quantities of hot, silica-rich fluid to the water. 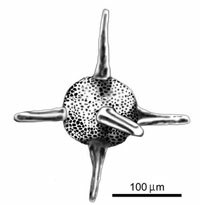 The additional silica would sometimes cause a huge radiolarian bloom, depending upon whether live radiolaria were floating above the silica-rich waters. Changes in temperature or chemistry of the water could force the rapid precipitation of silica over a local or regional scale, sometimes with radiolarian organisms within the precipitate. Such chemical precipitation during the Flood would be a fruitful area for creationist research. I thank John Reed and Peter Klevberg for helpful suggestions on this manuscript. Oard, M.J., Only one ‘Lake Missoula’ flood, Journal of Creation 14(2):14–17, 2000. Return to Text. Pettijohn, Ref. 3, pp. 197–198. Return to Text. Pettijohn, Ref. 3, p. 196. Return to Text. Brasier, M.D., Microfossils, George Allen & Unwin, London, pp. 81–89, 1980. Return to Text. Racki, B. and Cordey, F., Radiolarian palaeoecology and radiolarites: is the present the key to the past? Earth-Science Reviews 52:83–120, 2000. Return to Text. Racki and Cordey, Ref. 7, p. 87. Return to Text. Pettijohn, Ref. 3, p. 404. Return to Text. Racki and Cordey, Ref. 7, pp. 91, 111. Return to Text. Racki and Cordey, Ref. 7, pp 108, 111. Return to Text. Reed, J.K., Natural History and the Christian Worldview, Creation Research Society Monograph 11, Creation Research Society, St. Joseph, 2001. Return to Text. Pettijohn, Ref. 3, pp. 404–405. Return to Text. Racki and Cordey, Ref. 7, p. 97. Return to Text.